Welcome to F. McConnell & Sons, Inc.
F. McConnell and Sons, Inc. (McConnell's) is the Midwest’s most trusted Convenience Store and Foodservice Distributor servicing Indiana, Ohio, Michigan, and Kentucky. 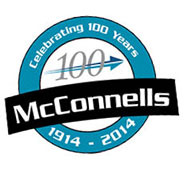 McConnell's has been a strong, family-owned company for 100 years! You only stay around that long by doing things the right way. What do we have to offer? Nearly everything. We are a full-service distributor - with the emphasis on service. We fulfill the needs of chain and independent convenience stores and foodservice locations (e.g., restaurants, schools, taverns, yogurt shops) offering over 10,000 items. At McConnell's, our mission is to excel in all phases of convenience store and foodservice distribution, partner with our customers and vendors to ensure our mutual success, and be respected for our people, products, and performance.